"Whenever I have excess seasonal fruit, I freeze it in chunks for fast and easy slushes and smoothies. Here's a delicious way to use up some watermelon." Place the watermelon pieces onto a plastic-wrapped baking sheet, and freeze until solid, about 45 minutes. 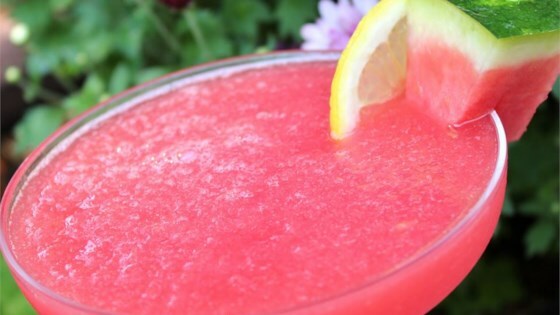 Place the frozen watermelon, water, and strawberry lemonade drink mix in a blender; blend until slushy. Surprising yet delicious combination of ingredients for a light salad! Great after school snack for kiddos....and so much better than a Sonic slushy! I used regular lemonade mix, and they loved it. I only rated this three stars because it was too bland/simple. I had to add some frozen lime juice, crushed ice and Tequila! Awesome! so good and so easy! Plus, I now know to freeze my surplus melon for use later! I love it! Pretty tasty I would recommend freezing the watermelon for over 45 mins and adding ice as there wasn't much slush to it. Mixed up my own sweetened drink mix as mis7up suggested, then followed the recipe as stated. Another great cooler for the hot summer weather. Awwww hits the spot! Love it. I use lemon aid mix or sometimes a squeezed lemon and my frozen watermelon. I serve it to company and they are amazed with the taste and the idea of using frozen watermelon. Big hit!! Made this today for my son who loves watermelon and strawberry lemonade. So simple but so incredibly easy and very good. Thanks for sharing! I made this, but I added a 1/4 cup vodka and only used 1 cup of water. I think if I make this again, I will use 1 cup ice instead of water. It's a little watery.